Eggs, rich in high-quality protein, are a nutritious and inexpensive meat substitute. Low in calories, they great when alone or used in a wide variety of recipes, such as sauces and baked goods. This versatile food, once shunned for their high cholesterol content, can make up part of a healthy diet for most individuals. In addition to protein, eggs provide vitamins and minerals essential for optimal health. One egg is the equivalent, for protein, of 1 oz. of red meat. According to the U.S. Department of Agriculture, Agricultural Research Service, one whole large egg provides 75 calories, 6 g of protein, 5 g of fat, 1.6 g of saturated fat, 0 g of carbohydrate, 63 mg of sodium and approximately 213 mg of cholesterol -- more than the daily cholesterol allowance for someone with high cholesterol or heart disease. Most of an egg's protein is in the white portion while the cholesterol is found in the egg yolk. Despite their cholesterol content, egg yolks also come packed with vitamins and minerals. Egg protein serves as a standard protein source. In fact, it's such a great source that it sets the standard to which other protein sources are compared. Egg-white protein is referred to as egg albumin and is often used by athletes and bodybuilders in powdered supplement form. Egg protein has a score of 100 on the biological value index, meaning it contains all of the essential amino acids, and has a perfect score of 1.0 on the Protein Digestibility Corrected Amino Acid Index. These indexes measure a protein's completeness and quality. 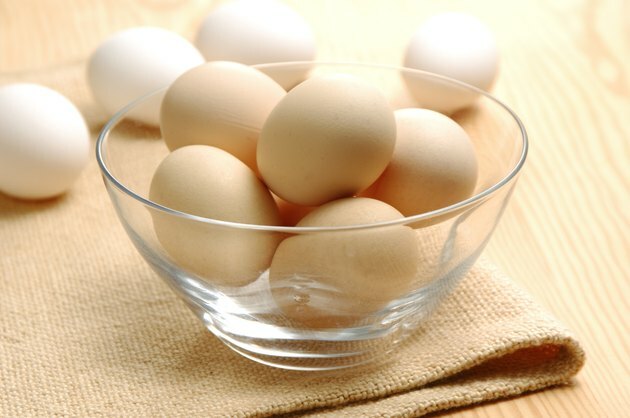 Eggs provide vitamin B2, or riboflavin, and vitamin B12, or cobalamin. One large egg provides 0.25 mg of riboflavin, meeting 15 percent of the recommended daily value for this nutrient as well as 0.6 mcg of vitamin B12, or nearly 10 percent of the recommended daily value. Riboflavin, like other B vitamins, plays a role in energy metabolism, or breaking down the foods you eat into energy your cells can use. Vitamin B12, found almost solely in animal foods, helps you make genetic material, or DNA, as well as red blood cells. All of the B vitamins are important for promoting a healthy nervous system. Egg yolks, according to the Iowa Egg Council, contain lutein and zeaxanthin -- two types of antioxidants. The content of these antioxidants in an egg yolk varies and depends upon the hen's diet, however, it has been reported that the body's ability to utilize the lutein and zeaxanthin in egg yolks is better than that found in leafy greens, such as spinach, according to an article published in the "Journal of the American College of Nutrition" in 2004. Eating 1.3 egg yolks daily increases blood lutein and zeaxanthin levels significantly. These antioxidants promote eye health and those with increased blood levels experience lower rates of developing age-related macular degeneration. Eggs are a good food source of several essential trace minerals, selenium, molybdenum and iodine, according to the World's Healthiest Foods website. One large egg provides 13.5 mg of selenium, meeting 19.5 percent of the recommended daily value; 7.5 mcg of molybdenum, or 10 percent of the recommended daily value; and 23.7 of mcg iodine, or nearly 16 percent of the recommended daily value. Eggs also contain a small amount of iron, a mineral important for blood circulation. Selenium helps prevent cells from damage, promotes immune system health and is necessary for regulating the thyroid hormone. Molybdenum, according to the Oregon State University, is a key component of the enzyme sulfite oxidase, which is used to metabolize certain amino acids, or building blocks of protein. Like selenium, iodine is important for proper thyroid function.